OUR ADVERTISING POLICY: mtl magazine is published by and for the community of Mt. Lebanon. The publisher reserves the right to refuse any advertising that is inconsistent with our mission statement or aesthetic standards. PURCHASE AD SPACE IN OUR PRINT MAGAZINE, WEBSITE, OR BUY SPONSORED CONTENT IN EITHER MEDIUM. SOCIAL MEDIA MENTIONS ALSO AVAILABLE. 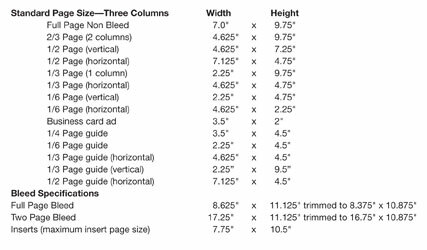 All digital ads must be sized exactly to the appropriate ad size (see published ad sizes). Ads must be sent as a .pdf or .eps file properly formatted in CMYK color (no spot colors), Macintosh compatible and saved with embedded fonts and high resolution 300 dpi graphics. PhotoShop files should be flattened and saved as a PhotoShop .pdf. Illustrator files must have fonts converted to outlines before being saved as an .eps file. Quark and InDesign files should be converted to a .pdf file. We do NOT accept raw PC, Word, PowerPoint or Publisher files. If you are unable to save your document in the required .pdf format, contact a local printer such as Banksville Express, Minuteman Press, Bethel Printing, Greentree Printing or Kinko’s, who will be able to convert the file for you and embed your fonts and graphics. Other local printers can provide this service. mtl magazine does NOT provide file conversion services. Copy files to a CD and send the disc to us. Include a color laser ad proof at 100%. If the document cannot be readily opened or the components of the file are substandard (less than 300 dpi), the advertiser will be notified of such and the file will have to be corrected and resubmitted. Please name your ad (advertiser/issue/date/mtl). example…Advertiser1-12mtl. mtl magazine will not assume responsibility for fonts that print improperly (default) when ad files are received without your fonts embedded. mtl magazine has only a limited MAC font database, which makes it impossible at times to match advertisers’ fonts, especially in ads generated on a PC platform. This is why all fonts must be embedded in your ad file as a .pdf or .eps. Digital files submitted to us in the required format will allow mtl magazine to place your ad directly within our magazine file in a ready to print format. Any digital files provided to us that require additional magazine staff time to meet specified requirements will be subject to a $30 art fee. Mt. Lebanon Magazine’s website, www.lebomag.com, includes space for banner ads sized at 300 x 300px. Ad should be supplied in jpeg format and sent to leboads@mtlebanon.org. Please format your ad with at least a 2 pixel rule around the entire ad. Space is available in the print magazine for approved sponsored content in two sizes: full page (500 words with two photos) or half page (300 words with one photo). Price is the same as regular ad rate. Word count is the same: 500 words with two photos for large ad; 300 words with one photo for small ad. Buy a mention on our Twitter or Facebook platforms. Prices by request. Contact amartin@mtlebanon.org for rates and deadlines. Or mix and match! Packages are available with both print and digital ads, custom tailored for your business.